Chinese Arborvitae brings a warm glow to the landscape with its rich golden foliage. 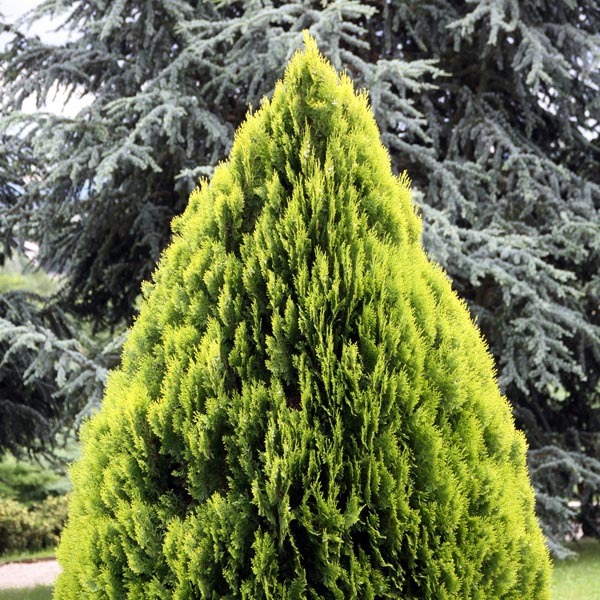 The overall habit is similar to the green upright arborvitaes and the uses are the same. They grow quickly and are a good choice for a hedge or privacy screen. Have fun mixing different flower and foliage textures with golden arborvitae in a mixed border. Prune freely to maintain the desired size and shape. Many small bird species will find the dense foliage a safe and appealing place to build nests. Perfect for narrow spaces and small garden settings. Great planted along a wall or fence or used to create a natural fence or border. A nice soft texture for mixing with other types of evergreens. Very easy to grow in virtually any location. Plant in a reliably sunny spot. Best in organic-rich, well-drained soil. Water regularly until established. Prune to maintain desired shape.